I don't know if I should claim any credit for this finally happening, but I have been fairly vocal about it for a long time on several forums. 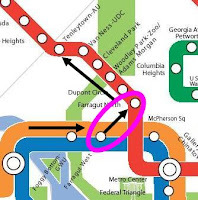 Finally on Saturday, October 29, 2011, the "Farragut Crossing" virtual/invisible tunnel transfer option began between Farragut North and Farragut West stations. "I can't take credit for this idea--I read it somewhere else--but it's so good that it needs to be promoted and publicized until Metro takes notice and implements it." That was August 30, 2008, 38 months ago. I'm glad to see it finally happened, but it's a bit discouraging to see that a no-brainer idea like this one can take so long. Imagine how long something expensive or contentious would take. For history buffs, here's a comprehensive listing of all my posts and some other relevant links. Enjoy! Give it a try and let me know how it works. I guess Metro gets credit here(?) too for finally thinking, or rather borrowing and implementing others thinking(?) on how to actually make Metro rail better for folks. So many people in these organizations/institutions are brain dead.